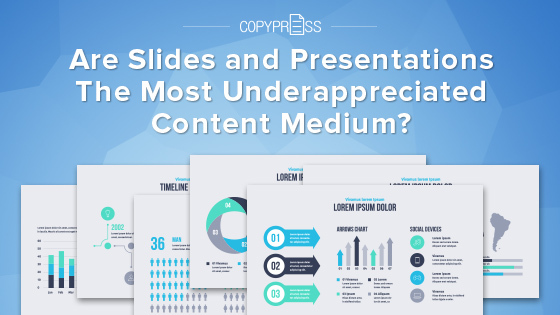 Are Slides and Presentations The Most Underappreciated Content Medium? PowerPoints have been around for decades, so it’s easy for us to take them for granted. But the fact remains that PowerPoints (and other slide or presentation tools, like Google Slides) are still a great way to visually break down information. 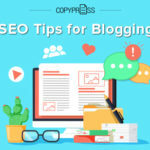 They also can help you repurpose your content into a different format that is easier to digest for those who don’t have time to read a long article. Creating presentations to repurpose or add to your existing content has likely fallen off the radar, as we still traditionally think of this format as best for conferences or meetings. But presentation slides can be used to break down longer content, share our content on additional platforms, and turn presentations into additional media formats. 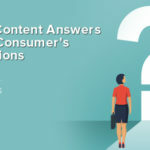 We break down ways to integrate PowerPoint or slide presentations into your content marketing efforts below. 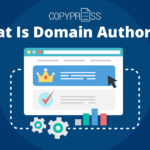 Whether the normal blog posts you write are over a thousand words or you have additional long pieces of content like ebooks and white papers, creating a corresponding PowerPoint presentation has a lot of benefits. Not only are presentations free to create (minus development and promotional time spent), they usually are available to create instantly using software or services you already have, like PowerPoint, Google Slides, or Prezi. By breaking down longer content, you are making it easily acceptable to more people. The three ways people learn best still translates into the business world, and by breaking content down visually, some users are better able to absorb it. When it comes to creating presentations or slideshows about your content, think about what would be most important for the user to know. Don’t have cluttered slides that basically repeat the information you just shared in the long content. Be brief, as users’ online attention spans are not more than a few seconds long. Text should also be on a contrasting background (usually black text on a white background is usually best) and don’t take up space with graphics that don’t add to the conversation or won’t engage the reader. A PowerPoint presentation may also be a good place to include any graphics or charts that were used in the content and are worth repeating. For instance, if you had a guide about proper recycling that included a chart with what is accepted, that would make a good addition to a presentation, because it visually breaks down the information. Otherwise, for text, try to keep your text down to a few bullet points or main quote/statistic per slide. Less is more by today’s design standards. If you don’t have a graphic designer available to help you design slides that have a cohesive design, try using the templates available on Google Slides or at Slides Carnival. Both options allow you to download the presentation as a PDF or PowerPoint file. Once you’ve created your presentation, you can upload it onto SlideShare, which is a visual content sharing platform that was acquired by LinkedIn in 2012 for $119 million. It lets you upload PowerPoint files, as well as PDFs and infographics. SlideShare is a good platform for your presentations because it can be treated as a separate social media platform to share content, much like YouTube. Businesses or individuals have their own profiles and can follow other users. SlideShare can bring big visibility to your content. According to LinkedIn, SlideShare gets 70million unique visits monthly and is one of the top 100 websites in the world. 80 percent of its traffic comes from organic search since Google indexes presentation pages. Stats on the presentations are also publicly visible, so anyone can see how many times a presentation or other visual content piece has been viewed and downloaded. You can change the privacy and download settings for each presentation as needed, but obviously making everything public will encourage more views and engagement (likes, downloads, etc) on your uploads. These data points (as well as tracking any referral traffic from SlideShare, since you can share links in the upload descriptions) can help you see what type of topics are most popular in slide format. Because SlideShare is owned by LinkedIn, you can also connect a personal profile to a SlideShare account to share presentation uploads. Currently, SlideShare doesn’t allow you to do the same with LinkedIn company pages. The presentations appear in the “summary” section of your LinkedIn profile. Luckily, since you have to connect your SlideShare account directly, no one can share your presentations on their profiles in the summary section. This prevents plagiarism. 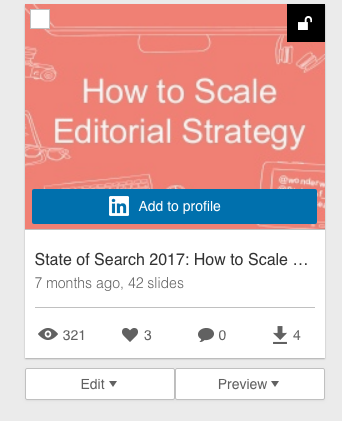 Users can share links to your SlideShare uploads, but it just appears in their feed as a regular piece of linked content. Where Else Can You Share Presentations? Besides SlideShare, consider other platforms that would take PPT or PDF versions of your presentations. You can embed corresponding SlideShare presentations or PDFs into your blog or article pages, and some websites even create content libraries with linked or uploaded content for users to browse and search. Share the content at the right time to keep users interested and engaged. It’s helpful for users to be able to go and forth throughout slides in a presentation, but this process can also be automated to turn the presentation into a video. This is a perfect option for any organization who wants to do more video but doesn’t have the studio or on-air talent they need to create instructional media. PowerPoint lets you export a presentation to a video, but you must have the advances and timers set up before converting in order for the slides to advance on their own. If you are using Google Slides, there isn’t a default option to convert a presentation to video. You have to download the presentation as a PPT and then open it into PPT to convert to video (same with Prezi). Besides simply creating a video of the presentation advancing on its own, you could also do a screen capture using a tool like QuickTime, Jing, or Camtasia and record your voice over the presentation as you go through the slides. This gives the video more of a webinar feel. If you’re looking for a more automated way to turn your content into video, you can also check out Lumen5, which has free and paid account levels, up to $99 per month. This tool lets you input a blog URL and will automatically create a video with slides for you. You can customize the stock images and music that goes along with the slides. The text from the slides is mainly pulled from the headers and other main points in the article, but you have some control over what text is used. RSS feeds can also be used to create videos as well. Once you have turned your content into videos, you can start outlining a promotional and platform strategy. If you have a YouTube account, it makes sense to upload them there, as they can then be easily embedded into your long-form content pieces. If the presentation was created around a downloadable or lead generation content, add the video to the landing page as a teaser. Republishing the native video file on Facebook, Twitter, or other platforms that allow video can also help you get more mileage out of your content. Native videos uploaded to Facebook get more engagement and a higher reach, on average, than linked videos to YouTube. This makes sense, as Facebook would likely prefer native content uploaded to their own platform over linking to an external site. Another type of media besides video you can turn your presentations into is images or gifs. 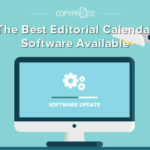 These allow you to still capitalize on the media and visual component of presentations, without being limited to the PPT, PDF, or video formats as discussed. Once your presentation is created, you can save slides as JPG files in PowerPoint or simply create screenshots of slides (which may affect the image quality). In addition, from the presentation videos you’ve created, you can take snippets and turn them into gifs as well. These won’t have audio but could be a cool way to highlight slide animations or alternating between two corresponding slides. Create a gallery of saved images or just use a few in your blog post. 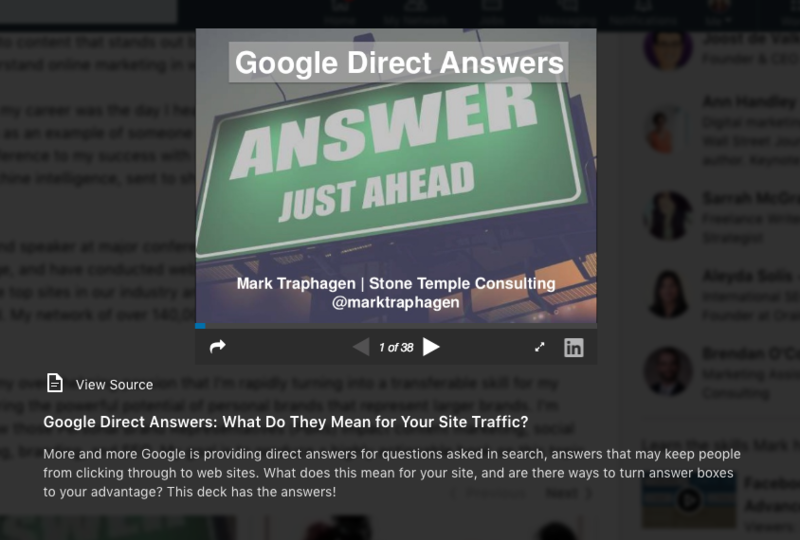 Upload to Pinterest, LinkedIn, Twitter, Facebook, etc with a link to the corresponding blog post to drive traffic. Add gifs to giphy, which is currently the most popular search engine/database for gifs. Add keywords to help gifs be found in search. Add a few images of the most important or interesting slides to your event recap if you did a webinar, live speaking engagement, or other video with the presentation. Repurposing content into new formats like presentations or slides is only useful if we keep it top of mind. 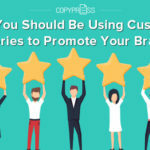 Whenever you are building content marketing and promotional campaigns, always be thinking about how you can translate your written content into a visual format. Using slides and presentations to get more content visibility, break down concepts for different learners, and share your content through different formats can help the content you are creating be more “productive.” Instead of constantly churning out written blog post after written blog post, consider how each one can be “chopped up” to turn it into something new without having to start from scratch.